WASHINGTON ? 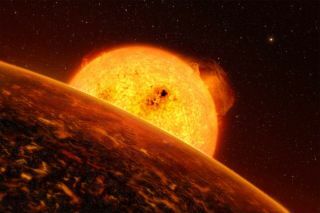 A rocky extrasolar planet knownto have wild temperature extremes may also covered in volcanoes. The planet,CoRoT-7b wasconfirmed to be orbiting a star some 480 light-years away in October. Whileit has a rocky surface, it is unlikely to harbor life because it sits so closeto its parent star ? temperatures may be as high as 4,000 degrees Fahrenheit(2,200 degrees Celsius) on its day side and as low as minus 350 F (minus 210 C)on its night side. Newevidence suggest that this forbidding world is even more unfriendly to life:Unless the planet's orbit is almost perfectly circular, it could also beundergoing fierce volcanic eruptions, astronomers announced here at the 215th meetingof the American Astronomical Society. CoRoT-7bcould even be more volcanically active than Jupiter'smoon Io, which has more than 400 volcanoes and is the most volcanicallyactive body in our solar system. "Ifconditions are what we speculate, then CoRoT-7b could have multiple volcanoesgoing off continuously and magma flowing all over the surface," said RoryBarnes of the University of Washington in Seattle. Volcanismhas implications for the development of life, because it constantly remakes aplanet's surface, making it hard for any organisms to gain a foothold. Paststudies of CoRoT-7b also suggest the planet?s atmosphere is made of vaporizedrock that may rain down on the surface from time to time. Barnes andhis colleagues think that CoRoT-7b may be so highly volcanic partly because itsits so close to its sun, at a distance of just 1.6 million miles (2.5 million km),or 60 times closer than Earth is to the sun. Any deviationsfrom a circular orbit ? even just 155 miles (250 km), according to Barnes'calculations ? would cause CoRoT-7b to receive a significant gravitational tugfrom the next planet out in the system. These tidaltugs would cause the surface of the planet to flex and distort, which wouldtrigger volcanism. Earth alsoexperiences tidal forces, but its oceans absorb this energy. "CoRoT-7bmost certainly has no oceans. A planet on a non-circular orbit experiencesdifferent amounts of gravitational force at different points along the orbit,feeling the strongest gravitational pull when it is closest to the star and theweakest when it is most distant," Barnes explained. "As the planetmoves between these two points, it stretches and relaxes. This flexing producesfriction that heats the interior of the planet resulting in volcanism on thesurface."